The FFLOR - Future Factory @Lorraine platform, which brings together innovative solutions for the plants of the future to make them more efficient, more flexible and more agile, was inaugurated on January 30, 2017. Fives is one of the 12 partners of FFLOR, which is led by CEA Tech, the CEA's technological research division. The FFLOR “Factory of the Future” platform offers industrial companies the opportunity to improve and facilitate their production processes by testing and then approving the new concepts of the plant of the future. It is located at the heart of the PSA site in Trémery (Moselle, France). Throughout the FFLOR's 1,000 m² space, different equipment is used to implement the key production technologies of the plant of the future: collaborative robotics, cobotics, virtual reality, smart logistics, and smart, inter-operable systems. Fives is one of the platform's twelve partners, which include industrial groups, integrators and regional SMEs. Through its Automation team, the subsidiary Fives Cinetic based in Héricourt, the Group contributes its expertise in designing and supplying full, automated and integrated systems. At the FFLOR platform, Fives integrated an IIWA collaborative robot, for which it developed a cobotics application (robot assisting a human) that improves productivity. In this case, the application is used to position and tighten lubricating oil injectors arranged in each of the engine's cylinders. The robot precisely positions the oil injectors, holds them in place and provides sufficient clearance allowing the operator to screw them in place while precisely checking the tightening torque. 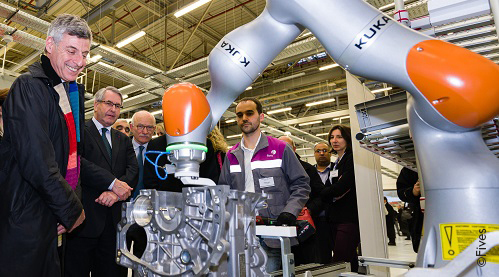 The collaboration between the operator and the robot guarantees that the task is carried out to perfection. To know more about the FFLOR platform (in French only), click here!